"Western Turf Wars-The Politics of Public Lands Ranching" by Mike Hudak is being touted as a must read for all who are interested in what is really going on behind the scenes with our public resources. One reader stated, "We knew it was bad, we just didn't realize how bad!" "The horrendous damage done to millions of acres of fragile public lands in the arid West by overgrazing livestock has been documented in a number of books, media articles, and scientific journals in recent years. Less often told is the real story about the ultimate cause of this devastation of our public heritage: the blatant and unconscionable wielding of political influence on the part of too many agency officials, politicians, and stockmen (and women) to keep those numbers (and damage) at unsustainable levels." "Reality on the range is something quite different. Today, as in the past, western ranching degrades, even destroys, millions of acres of wildlife habitat on public lands. Scarce water supplies are threatened. Fragile ecosystems endangered. This environmental destruction continues in spite of numerous laws and regulations intended to make the management of livestock grazing ecologically sustainable. Why do such environmental impacts persist? Are the laws inadequate? Are the agencies incapable of enforcing the laws? Are the management techniques ineffective? And what role does the livestock industry, and ranchers themselves, play in the management?" "Seeking answers to these and many other questions, Mike Hudak traveled throughout the West speaking with former employees of wildlife and land-management agencies, and citizens who have long advocated for better management of our public lands. Western Turf Wars is a compilation of these accounts—testimonies that reveal how and why the management agencies have failed to protect our public lands." The following is posted on Willie Nelsons Peace Research Institute. Please take a few moments out to visit the site and thank Willie for his support of America's horses! Well, it’s soon to be history, so it’s better to write it down now. Last year we came so close to ending horse slaughter when the US House of Representatives overwhelmingly passed the American Horse Slaughter Prevention Act only to see the bill die when the US Senate failed to act before leaving for its holiday vacation. Thanks to the people at Animal Welfare Institute, my family (that’s my daughter Amy pictured with one of the horses we rescued from slaughter) and thousands of compassionate Americans, the states of Texas and Illinois have outlawed horse slaughter for the purpose of human consumption, which in turn, closed down all three U.S. Horse Slaughter Plants. But the fight is not over. Though our horses have always been sent to other countries for slaughter the incidence of horses slaughtered in Mexico and Canada has risen dramatically over the last year. The US-based foreign-owned horse slaughterhouses continue their cruel industry with US horses by sending them to their plants in Mexico and Canada. In Mexico, the horses are savagely stabbed in the back of their necks with knives countless times, and then hung upside down to have their throats cut. 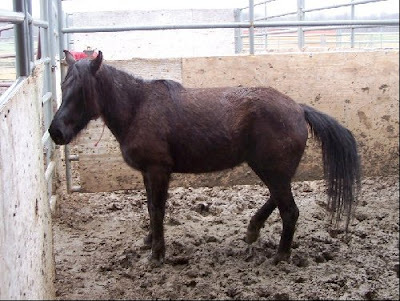 This is after being transported 700 miles plus without food or water. I’m sorry to bring this bad news, but I have faith that Americans will put an end to it once and for all. Surely when the men and women of Congress become aware of this, they will expedite The American Horse Slaughter Prevention Act (H.R. 503/S. 311), which will outlaw the transport of horses to other countries for slaughter. So let’s tell them about it. Our horses need your help! Recently, AWI and other humane organizations and equine rescues met in DC to work for the horses. They are developing programs to protect horses and support the growing number of equine rescues. Sadly, the pro-horse slaughter advocates won’t stop with their misinformation campaign. We just have to put aside the American Veterinary Medical Association’s wild claim of 100k horses a year in need of a home. Again, the slaughterhouse kills what it needs, not what is out there in need of a home. When we have seen such wide fluctuations in numbers there hasn’t been an issue. The numbers dropped from over 300,000 killed the 90’s to 47,000 a few years ago. We had fewer rescues and there was no increase in cruelty or horses running down the streets. All sizes, breeds and ages of our horses are being brutally slaughtered each year. These numbers include our precious wild horses, an animal that symbolizes the American spirit like no other. Sadly, due to gross mismanagement by the federal agency tasked to protect these amazing animals. If we allow the Bureau of Land Management to continue on its current path unchecked, they will drive these animals into extinction – many having been sent to slaughter. They would have you believe that approximately 24,000 wild horses are responsible for devastating over 300 million acres of public land, while over 8 million cattle and other livestock roam in harmony with nature. It is time to stand up for an animal that evolved in North America before it is too late. We’ve come too far to let this be our end result. It’s time to flood the phone lines, mail boxes and emails of our legislators again. Ask them to cosponsor and demand a vote on the American Horse Slaughter Prevention Act (H.R. 503/S. 311). It should be easier than ever for Congress to do the right thing and pass this bill that will end so much suffering. 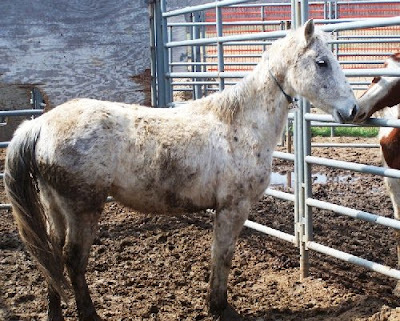 When the overwhelming majority of Americans are against horse slaughter, and we’ve already gone so far as to end it in this country, the obvious next step is to seal the deal with passage of the American Horse Slaughter Prevention Act and ensure that no more of our horses have to face such an ugly end as brutal slaughter. For more information on this and other similar issues, visit www.awionline.org and http://www.compassionindex.org/. 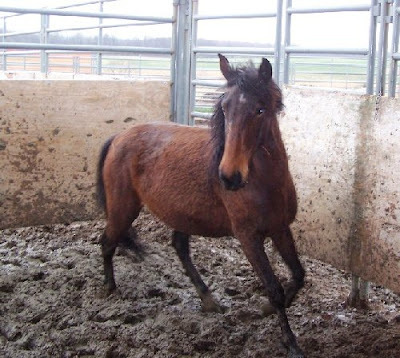 If you would like to join me in adopting a horse please visit http://www.habitatforhorses.org/. Whispering Winds Mustang Ranch, located just South of Roseburg, OR, has recently announced the expansion of their Rescue Facilities. Specializing in wild horses, Whispering Winds Mustang Ranch is the largest wild horse rescue in the Pacific Northwest and has been included by SaveDaHorses as among their October Top Ten Rescues for Donations List. We are proud of the absolute dedication Whispering Winds founders, Tom and Susan Pohlman have shown towards helping America’s wild horses in need. Their place on SaveDaHorses Top Ten Rescues is well deserved as their unrelenting devotion and volunteering of time, energy, money and help have earned them a solid reputation in the “Who’s Who” of caring and compassionate Sanctuaries. Click to learn more about Whisper Winds Mustang Ranch and all they do! 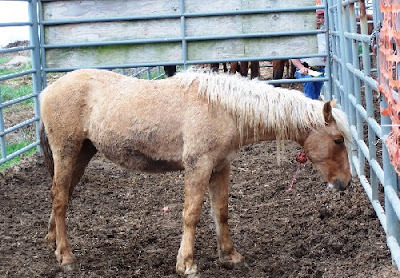 The Top Ten Rescues listed by SaveDaHorses are cited as the front line organizations that protect horses from abuse, neglect, slaughter issues and rescue horses from otherwise hopeless situations. Throughout October, SaveDaHorses is conducting a vote to determine the #1 Rescue on the Top Ten List based on community input and donations. To vote and donate to your favorite Rescue, go to SaveDaHorses Top Ten Rescues. 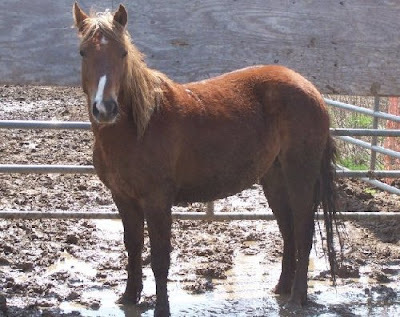 SaveDaHorses is a powerful website that graphically portrays horse slaughter, horse abuse and horse neglect, the majority of which is the result of solely promoting the financial interests of our current economic royalists, regardless of the abhorrent moral or ethical methods used to line their pockets. Articles and links on BLM Corruption and the Congressional Sell Out of Americas Wild Horses & Burros are also included on the SaveDaHorses website. 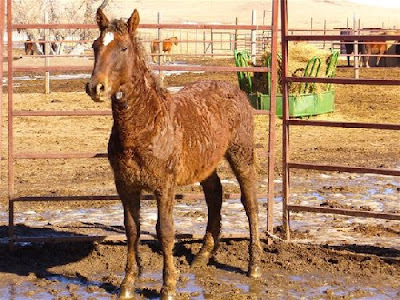 Find out why your support of these Top Ten Rescues is so important as they struggle to overcome the vast resources used by America’s rich and powerful that continue to promote agendas of greed at the expense of untold suffering to American horses everywhere. As mentioned, these Rescues are the front lines of HOPE, whose staff and members tirelessly and generously give of themselves to make the world a better place for us and the horses they rescue from grim and often times, indescribable bloody fates. So please vote and donate to your favorite Top Ten Rescue today! That’s right. Wyoming’s White Mountain and Little Colorado wild horse roundup party has just been cancelled due to a sold out show. The Removals, due to appear a week after the public comment period closed, denied the wild horses access to the event because there is no longer any space available in the overflowing containment centers now busting at the seams. With no more tickets for sale, BLM tried to negotiate a V.I.P. tour for the wild horses, which included backstage passes, food, drink, medical treatment and “party buses” to the arenas. Though disappointment was expressed that the wild horses were unable to attend the November festival, it is hoped space will become available by July 2008, when the Removals are next tentatively scheduled to appear. Led by MCs Cook and Cattoor, the Removals provide a dazzling display of equine acrobatics as wild horses plunge down mountain sides, barrel through streams, and test their endurance to see which of them can outrun the hovering helicopters roaring over their heads. The Removals Tour is not without controversy however, with much of the public expressing outrage at the exorbitant prices the Ticket Masters are charging for wild horses and burros to attend. The annual cost of the Removals Tour has now reached almost $40 million (3) and fans argue the Livestock Tour only has to pay $1.35 per month for their cattle and sheep, so why is the cost of the Removals Tour so high? Guess that’s just difference between livestock staying at home instead of gallivanting around the countryside like the wild horses and burros do, being chased into big city dreams of stardom, prancing for gawking crowds, consuming rich foods and looking for small pens to retire in. 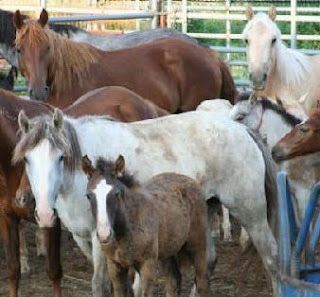 However, supporters of the Removals think the cost is worth it exclaiming, “Wild horses and burros are still just too wild!” They hope that after attending the shows, wild horses and burros will finally settle down and become more domestic or give something back to the community by volunteering themselves to Belgium, France, Japan and Mexico instead of just tearing up the home ranges with their wild animal antics. For now, the White Mountain and Little Colorado wild horses will miss their chance to join the fun but BLM promises they won’t have to wait long before being given another opportunity to be chased into big city dreams and all night mares. This story was written before yesterdays newspapers announced the cancellation of the Removals due to a shift in funding that has caused the Wyoming Governor to “have a cow” because Wyomings wild horse Removals have been postponed for Nevada wild horse Removals. Yet, according to a comment posted on Saturday in the article titled, Land of the Lawless, the reason for canceling the Removals was overflowing containment centers as per BLM Wild Horse & Burro Specialist Jay D’Ewart, who is responsible for overseeing the White Mountain and Little Colorado removal operations. While this story was just too fun to discard, it also raises the question: which story is BLM telling the public that’s the truth? Perhaps BLM doesn’t want to make a national announcement that holding facilities and containment centers are so full from prior attendance of the Removals that they can’t cram anymore in or perhaps the Wyoming WH&B Specialist is just out of the loop…..
(1) Removal numbers taken from BLM National Adoption and Removal Statistics, Fiscal Years 2001-2006 and BLM Gather Reports October 1through April 1, 2007. 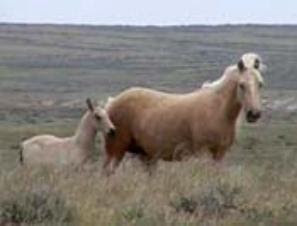 (2) Based on figures provided in An Economic Analysis of Alternative Fertility Control and Associated Management Techniques for Three BLM Wild Horse Herds by John M. Bartholow. Cost estimates were taken from budget planning spreadsheet supplied by Linda Coates-Markle, BLM/MT (4/29/2003) as interpreted by Don Glenn, BLM/DC (6/17/2003) and Lili Thomas, BLM/NV (9/22/2003). The National Wild Horse & Burro Advisory Board wants to know what you think about the Wild Horse & Burro Program and is accepting written public comments and input through October 31, 2007. Okay, not really but they are legally required to pretend. Since the Boards main function is to provide input to the Secretary of the Interior regarding the management of wild horses and burros on public lands, they really don’t give a hoot what the public thinks or suggests and the Board members are usually an appointed group of special interests that aren’t too interested in thriving free roaming wild horse and burro populations that cut into their piece of the American pie. In fact, the Board all cheered when BLM announced that the national wild horse and burro population had finally been reduced to the “National AML” at their meeting held in Las Vegas, Nevada in December of 2006. No one bothered to ask how many of those AMLs established viable herds, how many herds showed an AML that no longer had any wild horse or burro populations left in the Herd Management Areas, or if this national AML was truly a “thriving ecological balance” for the wild horses and burros. While you may have a great deal you wish to express on your own, here are some suggestions and recommendations that have been presented to the Board that you may also want to add to your “Wish List” of what a properly managed National Wild Horse & Burro Program would look like. 1. Request that your comments and others be included in their entirety when the Meeting Minutes are posted. The Board has received a great deal of public input, comments and suggestions over the years that gets filed in what equates to the garbage can. They are not required to address or respond to the public, there is no accountability of what they have been asked to address, research or recommend and the public has no idea what is being brought to their attention and subsequently ignored. Publishing the comments in full would at least give an accounting of how long it takes them to find solutions to the problems brought to their attention and let others know what the public is griping about or recommending. 2. Increase the number of positions that are actually involved in Wild Horse & Burro Advocacy. Currently, only one position is provided that is filled by a wild horse and burro advocate. Other Boards such as Agriculture and Wildlife have several positions that represent the focus of the Boards “objectives” – in this instance, it is the protection and preservation of wild horses and burros, and the National Wild Horse & Burro Advisory Board should accurately reflect this. There is enough livestock and big game interests manipulating BLM on every level of their management that adding a few more advocates won’t impact their influence significantly but might actually give the wild horses and burros a shot at being “preserved for future generations”. 3. Publish the names of all those that apply for positions on the Board. Often times, the same person is appointed over and over again (or as long as they are allowed) and no one has any idea if a much better qualified individual was passed over in favor of cronyism. Publishing who BLM denies to Board positions or appoints instead would go a long way in increasing the “sunshine” in the Wild Horse & Burro Program as these Board Members have a lot of influence on what is happening to our wild horses and burros and their habitat. 4. Ask for independent studies and research about the physical effects on wild horses and burros being driven by helicopters during the round ups. Also ask what the limits are on distances, temperatures and environmental factors such as steep terrain or heavy snow and ice. in Portland, Oregon on November 5, 2007. Include "Comments to the National Wild Horse & Burro Advisory Board" in your correspondence. Speaking of Wyoming, another wild horse round up is being planned, this time for the White Mountain and Little Colorado Herd Management Areas (HMA). Spewing statistical spin of seismic proportions, the Rock Springs Field Office offers us a solid look into the fantasy world of wild horse and burro “management”. Remember the public law that Congress enacted in 1971 stating the areas wild horses and burros “where presently found” would be preserved for their protection? In 2004, BLM reported that just the public lands for the White Mountain Herd Area covered more than 900k acres and totaled over 1.9 million when all the “other” acreage was combined. In 2005, almost 700k acres of the originally protected “public land” mysteriously disappeared and over 1.5 million total acres for the White Mountain herds is now gone. The White Mountain wild horses were last removed in November 2003, where again BLM confidently reported a remaining population of 205. While reproduction rates seemed normal for the next few years, suddenly the population exploded between 2006 and 2007, jumping from 295 to 817. Based on the 20% reproductive rate BLM asserts in the Assessment, the wild horse population should only be 425. BLM claims the current population is based on direct counts, not on the new census technique they have been working with USGS on for the last few years. So where did all these wild horses come from if BLM was so confident just 4 years ago that they had removed them to the “appropriate” number? The maximum allowable management level for the White Mountain herds is 300 wild horses and they have been issued 3,600 AUMs of forage compared to the 185,429 AUMs given to livestock operations in the area - only 2% of the food. The Little Colorado wild horses also had 153k acres of their originally “protected habitat” disappear between 2004 and 2005. The maximum allowable management level for the Little Colorado wild horses is 100 and they have been issued 1,200 AUMs of forage compared to the 40,088 AUMs given to livestock operations in the area - again only 2% of the food. This is the only environmental assessment that will be issued as round ups are scheduled to begin on or about November 1, 2007. Assuring the public that all comments and input will be seriously considered despite the round up already carved in stone, our only option is to tell BLM if we would like PZP injected into the herds or not. If PZP is used, this will be the first time for these wild ones. Be sure to include the name of the herds and this reference # in your submission. In the fall of 2005, BLMs Wyoming Rock Springs Field Office issued a wild horse removal plan for the Adobe Town and Salt Wells Creek Herd Management Areas (HMA). The remaining wild horse population after the 2005 removals, based on BLMs “in-depth” and confident authority was projected to be 861. We can only assume that taking 467 more wild horses during the 2005 removal operations was necessary to achieve this goal. What happened? A new census technique is what happened. BLM and USGS have been working on a new way to count wild horses in Wyoming that have produced some amazing results. For 30 years, BLM has been claiming their wild horse counts were within a 15% accuracy rate but now, USGS stated there’s an 800% increase in the Salt Wells wild horse population. How do we know? Well, we don’t really and questions to the National Wild Horse & Burro Advisory Board about this new method were met with the usual dumbfounded silence only these BLM appointed experts are capable of. Based on BLMs reported populations in February 2006, the Salt Wells Creek HMA went from 169 wild horses after the 2005 fall removals to 1,133 in February 2006. This also caused a dramatic increase in the projected new spring foals, bringing the Salt Wells population up to 1,349 by the summer of 2006. So what does all this mean? Is the old method of counting wild horses really that bad? Is the new method really that accurate? Is this just more “authoritative and confident” flimflam from the masters of spin to butcher viable wild horse populations? So far, public questions are only being met with silence while the costs of holding over 30,000 wild horses and burros continue to climb. The answer to yesterdays question, “Of the 199 Herd Management Areas remaining, how many wild horse and burro herds have been given an allowable management level of 60 or less? By this most recently “affirmed standard” the BLM used to zero out Colorado’s West Douglas wild horses, BLM has issued an allowable management level that is non self-sustaining to 36% of our herds. Now these numbers are only the ones that meet the criteria BLM has just legally affirmed as being too low to support a genetically viable population, this is not the established scientific standard. Just how dangerously low is America’s wild horse and burro herds being managed for? The article highlights results from DNA analysis and genetic viability studies conducted by Dr. Gus Cothran, a leader in the field of equine population genetics, which determined that the absolute minimum herd size necessary to maintain healthy, sustainable populations requires at least 150-200 wild horses - this is the absolute minimum recommended if the herds are to be preserved. A total of 209 herds and their AMLs were analyzed to determine how many met this criteria and only 52 areas, or 25% of the remaining herds are being managed for self-sustaining populations. While Dr. Cothran has worked very closely with the BLM in the sampling and testing of many of our American Herds, a transfer to the University of Texas A&M has brought about a long gap in the publishing of additional genetic testing and results. Here are the herds that can now be zeroed out using this newly “affirmed standard”. The numbers given for AML is the maximum number of wild horses or burros that BLM will allow within their federally protected habitat. Also bear in mind that it is BLMs policy to reduce wild horse herds by 60% of these numbers when they round them up and now often use the fertility control drug, PZP, on any of the mares released back on the range. Amargosa Valley-0, Applewhite-1, Ash Meadows-0, Blue Nose Peak-1, Blue Wing Mt-1, Bullfrog-12, Cherry Creek-0, Clover Creek-14, Clover Mt-16, Deer Lodge Canyon-50, Diamond Hills North-36, Diamond Hills South-22, Dogskins Mt-15, Eldorado Mts-0, Fish Lake Valley-54, Goldfield-50, Granite Peak-18, Highland Peak-33, Hot Creek-41, Jakes Wash-21, Lahontan-10, Little Fish Lake-39, Little Mountain-15, McGee Mountain-41, Meadow Valley Mt-0, Miller Flat-15, Moriah-29, Muddy Mountains-0, Palmeto-0, Paymaster-43, Rattlesnake-1, Red Rock-27 wild horses, 49 burros, Sand Springs West-49, Saulsbury-40, Seven Mile-50, Seven Troughs-46 burros, Silver Peak-6 burros, South Stillwater-16, StoneWall-50, Tobin Range-42, Warm Springs Canyon-24 burros, Wheeler Pass-35 burros, Whistler Mt-24, Hickson Summit-45 burros, North Monitor-8. Bible Springs-60, Chloride Canyon-30, Choke Cherry-30, Four Mile-60, Frisco-60, Kingtop-40, Mt Elinor-25, Muddy Creek-50, North Hills-36, Robbers Roost-25, Sinbad-50, Tilly Creek-50. Photo taken from BLM Website. With another zeroed out herd being “affirmed”, BLM announced they will immediately begin to develop the final removal plans for the estimated 120 remaining wild horses. BLM attempts to compensate for this decision by citing the 190k acre Piceance/East Douglas Herd Management Area is better suited for wild horse management and as a result, BLM raised the allowable management level from 140 to 235 wild horses to help offset the permanent extinction of the West Douglas herds. Of course, no wild horses from the West Douglas Herd Area will be moved to the Piceance/East Douglas HMA and all are slated for the adoption pipeline, long-term holding facilities or unconditional sale. The central focus of BLMs decision to revoke their federally protected status stemmed from officials determining the 128k acre habitat is only capable of supporting 60 wild horses. BLM then acknowledged this population is too small to be naturally self-sustaining or genetically viable. Though the best available science states that wild populations need to reach at least 150 individuals to preserve the herd, this “official affirmation” has now established a precedence allowing BLM to zero out herds solely on the basis of AMLs set at 60 or under. So today’s million-dollar question is…. Of the 199 HMAs remaining, how many wild horse and burro herds have been given an allowable management level of 60 or less? The Nevada Wild Horse Range, a.k.a. Nellis, is in the news again. This time BLM will be doing an “official” roundup in December and the public has three options to choose from. Remove 800-820 wild horses and leave 300. Of the 300, 150 mares will be treated with PZP again, even though BLM reports the 2003 treatment only changed the reproduction rate from 24% to 22%. What's really curious is that BLM reported the Nellis wild horse population jumped from the 600 BLM left after the roundup to 780 the very next year. That's a 30% reproduction rate in my book but maybe BLM uses the metric system. Remove 800-820 wild horses and leave 300. Of the 300, 150 mares will still be treated with PZP but 75 of the stallions will be gelded and “managed” as a gelding herd. Not remove the wild horses. Of course we all know what this means - terrible, terrible things will happen. Wild horses will starve, they will leave a wake of devastated forage everywhere they go, riparian areas will be obliterated, the entire area will be trampled to death, stream banks will become mud holes, they will leave trails that make our freeways look like parks, soil will become like cement due to their hoof compaction, blah, blah, blah. A few tasty new ones were added this time, including the military has been hauling water to the Nellis horses for over 2 years costing $12,000 a month and BLM is visiting the area weekly to monitor lame foals, some of which need to be captured and treated at an estimated cost of $500.00 per foal. Apparently, the Nellis wild horses are prone to clubfoot and for the first time ever, BLM is visiting them weekly to insure their health. Isn’t that nice? Of course, while they are out there they don’t fix the many “old/less functional water developments” and it is unclear if they have followed through with their 2003 promise to apply for water rights for the Nellis wild horses. One would think since it's been costing $12,000 a month for two years, BLM would have made securing water a top priority. If anyone’s wondering why so many wild horses are being taken, it’s because BLM changed the “allowable management level” (AML) in 2004 by cutting it in half. When BLM was doing the evaluation in 2003, their “Proposed Action” was to keep the AML the same (600-1000) but at the last minute, they changed their minds and approved these new, lower numbers (300-500). That’s why the Nellis wild horses are now considered “excessive”. Let's try not to remember the 178 wild horses already removed in July and 71 more now dead from drinking the water. Also, for the first time ever, BLM doesn’t want to discuss Southern Nevada's thriving ecological balance lest the public become aware of the fact that the “Sensitive Species” big horn sheep given such top priority in management decisions will now outnumber Southern Nevada’s wild horses by over 3-1 and their wild burros by over 5-1. (c) ask BLM to not remove them and be told that this can’t be done because wild horses are in terrible, terrible danger...or is it the range is in terrible danger or is it…well anyway, something’s in danger somewhere so the Nellis wild horses need to go to Palomino Valley to keep everybody “safe”. Be sure to include EA # NV-052-2007-362 in your response. Last week, Nevada veteran reporter George Knapp shared his thoughts on his recent interview with BLMs Nevada Wild Horse and Burro Lead, Susie Stokke, through the Knappsters opinion piece titled, BLMs Optimism Is Deadly published in Las Vegas City Life magazine. The interview was conducted just hours after BLMs announcement of the salmonella outbreak and pneumonia related deaths of over 130 wild horses at the Palomino Valley holding facilities in Northern Nevada. The Knappster held little back as he pondered Ms. Stokkes overflowing optimism, bubbly responses to a long list of allegations of inappropriate management in the wild horse and burro program, and continuously upbeat prognosis for Nevada’s wild horses and burros. Dubbing Ms. Stokke “Little Miss Sunshine”, it seems George found little substance behind her beaming rays as he attempted to get some real answers to serious questions about what is really going on in the wild horse and burro program. Letters to the Editors at Las Vegas City Life Magazine can be sent to letters@lvcitylife.com and everyone is encouraged to thank City Life for sharing this “alternative look” at BLMs approach to wild horses and burros placed in their care. The Bureau of Land Management Surprise Field Office in California has announced a scoping period for wild horse management actions and is requesting public comments. The Surprise Field Office recently removed 84 wild horses from the Wall Canyon HMA, 142 wild horses between the Bitner and Nut Mountain HMAs and 75 wild horses that had established themselves “well outside” any HMA boundaries totaling 300 for the area. The September roundups were based on decisions issued in the fall of 2005. As a result, BLM determined no public comments, current population census or EA was necessary to authorize their removals. This also prevented any public appeal of their “management” actions. The current scoping proposal includes the capture and removals of wild horses in the Buckhorn HMA, the Carter Reservoir HMA and Massacre Lakes HMA, as well as possibly renegotiating the “Appropriate Management Level” (AML) for Massacre Lakes. Buckhorn HMA spans 76,126 acres with an allowable management level not to exceed 85 wild horses. Last removed in November 2003, reported populations skyrocketed between 2005 and 2006, jumping from 71 to 239 and because of this, the current estimated population is approximately 344 wild horses. Based on the remaining wild horse population from the 2003 roundups and not including this stunning leap, wild horses in the area would only be about 122. Carter Reservoir HMA spans 22,934 acres with an allowable management level not to exceed 35 wild horses. Removed in November 2003, this wild horse population also saw a stunning increase between 2005 and 2006, jumping from 29 to 95 wild horses in the HMA. 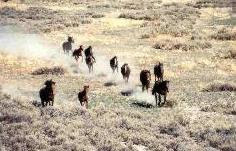 BLM reports a September 2007 helicopter census confirmed 104 wild horses in the area. Based on the reported remaining wild horse population from the 2003 roundup, wild horses would only number around 50. A Herd Area is supposed to be the original territory wild horses and burros occupied in 1971 becoming their “protected habitat” yet Herd Area acres seem to be in a constant state of flux. In 2004, BLM reported that the Massacre Lakes Herd Area spanned 127,728 acres but in 2005 the original Herd Area was no longer 127,728 acres, now it is only 65,658 acres. Then BLM further reduced this to a “management area” of only 37,350 acres, a loss of 90,378 acres or 70% of their “federally protected habitat”. The Wild Horse & Burro National Program Office reports that the Massacre Lakes HMA has an established AML of 20 wild horses but the scoping letter states the AML ranges between 25-35. The National Program Office projects a wild horse population of approximately 183 but the scoping letter states a census conducted in September 2007 found 110 wild horses in the area and that included 12 new foals. BLM reports the Massacre Lakes area hasn’t been gathered since October 1988. So how do wild horse populations double in size every 3-4 years if these wild horses haven’t been “managed” away for 15 years? Part of the proposed management action is that BLM may “adjust” the wild horse population’s allowable management level to accommodate the thriving ecological balance, which includes heavy livestock grazing and what has been referred to as the “Big Game Mecca” of Nevada. Massacre Lakes preliminary environmental assessment is expected to be out in early November so we can count on BLM giving serious consideration to anything brought to their attention through the public comment process. Information that would be really nice for BLM to provide for a change include: total livestock numbers authorized in the HMA, the amount of AUMs given to livestock and big game, estimated populations of big game species that include mule deer, pronghorn antelope, elk and big horn sheep, total number of water sources, recent monitoring data on more than one location in the HMA, actual dates on monitoring reports versus “recent” which often turn out to be years old, total miles of fencing that have been erected in the wild horse habitat, any future management plans such as introductions of other species, range improvement projects, and maybe even some current photos of the area and the wild horses. Reference #4700 (CA 370) (P) and be sure to include this # in your input. All Herd Statistics taken from BLM National Herd Statistics Fiscal Years 2004-2007 available at www.blm.gov Wild Horse and Burro Program. BLM reports that in addition to the salmonella outbreak, wild horses had also contracted pneumonia with 9-12 still being treated and 16 pneumonia related deaths so far. Many of the answers BLM supplies continue to raise questions, which include health conditions, treatments, capture methods, reproductive rates, livestock grazing, forage availability and lack of reliable population reports since the removals of 661 Jackson Mountain wild horses in 2003. BLM stated that the Jackson Mountain wild horses came in with snotty noses due to alkali dust from drought conditions and that no illness or deaths were a result of the capture operations. 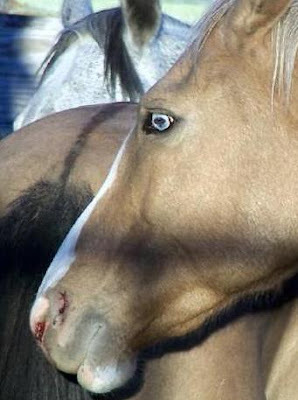 Yet this photo with blood coming out of this wild horses nostrils was taken at the temporary round up pens after helicopter removals conducted in the fall of 2006 and indicate that serious respiratory damage is immediately occurring to wild horses during the helicopter roundups without "drought conditions". A variety of questions and concerns were submitted to BLM during the public comment period for the Jackson Mountain wild horse gather plan, including a copy of a recently released report, The Use of Helicopters To Remove Wild Horses and Burros From Public Lands, a team effort compiled by a wide variety of wild horse advocates and concerned citizens that BLM choose to ignore. Concerns raised included BLM failing to consider the consequences of driving the Jackson Mountain wild horses by helicopters over very rugged mountain terrain with no specified limits on distances being run as well as failing to give priority to humane handling procedures over efficiency. 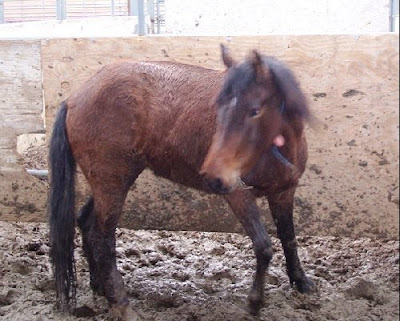 These concerns were expressed for healthy horses, not horses already severely weakened. There is also questions how wild horses dropped to such a low body score in merely a matter of 7-10 days before they were captured while BLM reports the remaining wild horses on the range are in “good condition”. This was one of the reasons BLM used to justify why immediate removals were necessary but that was before the new June census found 700 more horses in the area – then that became the new reason immediate removals were necessary. Another well-worn quote used is “resource monitoring data” indicated an overpopulation existed in the area due to “excessive utilization”. BLM has acknowledged that each of the “approved” wild horse population per livestock grazing allotment was not considered genetically viable but cited the “meta-population” as a whole insured their genetic vigor while simultaneously stating that the 79 miles of fencing found within the HMA severely inhibited genetic interchanges. The Jackson Mountain Gather Proposal stated no further fencing was planned but the Happy Creek grazing allotment assessment published just a month prior reported a proposed three mile fence around Happy Creek would have severe impacts to wild horse populations, including limiting genetic viability, sharply increasing competition with livestock, further reducing available forage and possibly causing injury or death. (4) Hard to believe BLM has specific regulations that prohibit extensive fencing in wild horse and burro habitat. Happy Creek itself is also preparing to introduce the Threatened Lahonan Cutthroat Trout, which will most likely result in further reductions in the “allowable management level” of the Jackson Mountain wild horses because it is general policy to not allow any wild horses in areas where Threatened or Endangered Species live, even if the horses were there long before managers formulated new plans to introduce these species. As long as BLM is able to continue to say this, excess resource utilizations will be attributed to wild horses, not the 7,800 head of livestock, fencing proposals will continue to corral them until they starve and inbreed, and drought conditions can be blamed for what is merely labeled as “snotty noses”. (2) Department of the Interior, Bureau of Land Management, Winnemucca Field Office, Jackson Mountain HMA Wild Horse Gather Plan, Preliminary Environmental Assessment EA#NV-020-07-EA-10, pg. 60, May 2007. (4) Department of the Interior, Bureau of Land Management, Winnemucca Field Office, Ten year Grazing Permit Renewal - Happy Creek Allotment, Preliminary Environmental Assessment EA #NV-020-07-EA-07, April 2007, Section 4.2.13 Wild Horses, pg. 36, Section 5.3.10.3, Cumulative Impacts, Alternative 1, pg. 53. The Pryor Mountain wild horses are Montanas last remaining herd of wild horses and like so many of the wild herds today, or those already irreplaceably lost, the Pryor Mountain wild horses are in danger of being managed to extinction. Cloud, a magnificent wild stallion in the Pryor Mountain Wild Horse Range, has been the subject of the PBS nature series documentaries, “Cloud – Wild Stallion of the Rockies” and “Cloud’s Legacy: The Wild Stallion Returns” as well as the inspiration for the animated Walt Disney feature, “Spirit”, and has become a prominent symbol for the plight facing our wild horse and burro herds across the Nation today. Help Us Live in Freedom!!! Emmy-winning filmmaker and Volunteer Executive Director of the Cloud Foundation, Ginger Kathrens, has been involved in extensive efforts to try and save this last remaining herd of now rare Spanish mustangs and they need your help. Montana Senators need to hear from the public NOW to protect Cloud and the Pryor Mountain wild horses before this majestic and historical wildlife vanishes from the American scene forever. Let your voice be heard by providing email comments to show your support. The Pryor Wild Horse Herd is the only wild horse herd remaining in Montana. The herd is threatened despite their popularity and their Spanish ancestry. BLM management plans call for the removal of Pryor wild horses to far below the standards for genetic viability - as low as 85 horses when 150 is generally accepted as the mininum standard to insure preservation!!! The Custer National Forest Service has refused to grant legal status to the wild horses that have lived there for hundreds of years, calling them trespassers and threatening to put up wire fence to keep them from accessing their historical higher mountain pastures. The Wild Horse & Burro Act clearly states that wild horses will be managed where found when the Act was passed in 1971. Wild horses are documented to have lived in the Forest Service area in question before, during and after the passage of th Act. Therefore, the Forest Service is in violation of the Wild Horse & Burro Act. Urge Senators Tester and Baucus to preserve a Pryor Herd for the future by forcing the Forest Service to recognize the legal right of the Pryor Horses to roam their historic lands adjacent to the designated Pryor Mustang Wild Horse Range in the Custer National Forest. 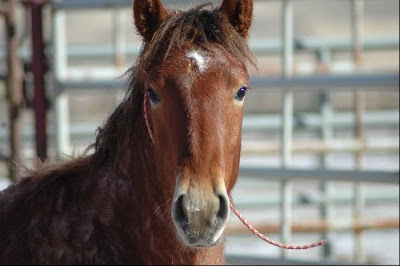 Urge Senators Tester and Baucus to stop BLM from decreasing the Pryor Wild Horses to levels that will destroy the herd. If you have visited the horse range, please include this. If you live in Montana, make sure the Senators know this. If you have other observations and personal statements about preserving the herd, please add these to your email. Your heartfelt comments will make all the difference. Here’s how to send your message. Go to Senator Tester and Baucus’ websites. Click on Email about an issue. Type in your name, etc. Ask for a reply and submit your comments. Please do what you can TODAY. 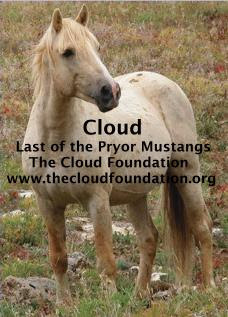 Ask others in your address book to do the same and have them sign up on the Cloud Foundation email list by simply emailing support@thecloudfoundation.org and typing “add my address” in the subject line so you can continue to stay informed on Cloud, his herd and the efforts to preserve the Pryor Mountain Wild Horses!!! Thanks so much for your participation, for speaking up, for trying to prevent America’s wild horses and burros from “fast disappearing” and to insure their preservation for the enjoyment of future generations. Wonder how many key water sources were included in this withdrawal? The first part of these cleansing operations occurred the beginning of August in the Jakes Wash HMA, where every horse BLM could gather was removed. As is a common pattern with removal operations, BLM gathered less wild horses than they projected but removed more than they originally planned. Jakes Wash has a very active removal history; records for July 2001 indicate 98 wild horses were removed, followed by an additional 77 in February 2003, July 2004 saw 49 more taken and then the current removals of 97 this past August. 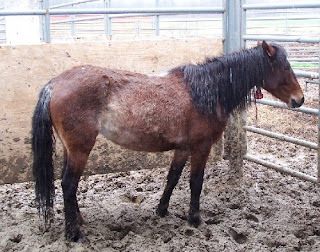 (8) This removal history was not made fully available in the June wild horse capture EAs, only in the just released grazing renewal for the White Rivers Ranch and Toms Plain Allotment. The removals of the Jakes Wash Herd and their “management” was legally appealed through the Interior Board of Land Appeals (IBLA) after the final decision was issued for their removals, but as always, any public protest automatically becomes a “Moot Point” due to BLM timing their decisions that allow the wild horse and burro populations to be whisked away faster than IBLA can respond to the public protests. This lack of self-sustaining populations is of little consequence to BLM as managers stated in the gather proposal that chances were very high of both these “protected habitats” being completely zeroed out in the new 2007 Resource Management Plans, soon to be released some time this month. For BLM, this is a win/win situation because even if there are public protests lodged against the zeroing out of the Moriah and Jakes Wash HMAs during the Resource Management Plan Final Decision, the handful of wild horses now remaining will be too old, too weak, and too few to do anything more than just die off and disappear. It also gives BLM the advantage of another popular stratagem employed in their wild horse “management” - legally removing wild horses from the nearby Monte Cristo HMA. Though BLM knows Monte Cristo wild horses migrate into the Jakes Wash HMA for seasonal use, by zeroing the Jakes Wash HMA out for all wild horse use, BLM will merely remove the Monte Cristo horses when they arrive and file them under “outside the HMA boundaries”, even though they are only moving to historical habitat once considered “protected”. (8) BLM Ely Field Office, Proposed Decision and Finding of No Significant Impact, Issued 9/12/07 White River Ranch Term Permit for the Tom Plains and McQueen Flat Allotments,EA # NV-040-06-015, pg. 17. (10) BLM Ely Field Office, Proposed Decision and Finding of No Significant Impact, Issued 9/12/07 White River Ranch Term Permit for the Tom Plains and McQueen Flat Allotments,EA # NV-040-06-015, pg. 6. EA# NV-040-07-044, pg. 6, June 2007. 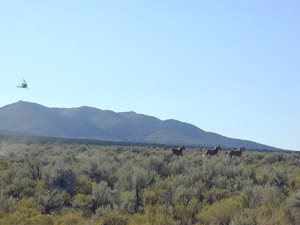 The Highland Peak livestock allotment itself had been vacant for several years, including in 2003 when BLM established the new forage allocations for the Highland Peak Herd. However, it was recently re-authorized in January of 2007 for 4,508 AUMs of forage dedicated solely for exclusive use by sheep. BLM personnel confirmed that 6,600 sheep were authorized for grazing in the area but only about 2,200 were actually utilizing the allotments. (5) These numbers were for the all the grazing allotments within the Dry Lake Complex but based on the new forage allocations, the Highland Peak HMA area is only authorized for approximately 1,800 sheep. It also helps BLM justify to Congress why the For Sale Authority must stay in tact to help reduce removal and containment costs - until inbreeding can finally finish the job. (1) Dry Lake Complex Wild Horse Gather Plan and Preliminary Environmental Assessment, EA#NV-040-07-002, Department of the Interior, Bureau of Land Managment, BLM ELy Field Office, December 2006. (2) Proposed Decision and Finding of No Significant Impact, Bennett Springs, Black Canyon, Klondike and Highland Peak Allotments, term permit renewals (EA#NV-040-07-21), Department of the Interior, Bureau of Land Management, Ely Field Office, Spetember 20, 2007. (3) Dry Lake Complex Final Gather Report, Courtesy of Ben Noyes, December 2006. (5) Personal Email Communication, Ely Field Office, Received 2/2/07 12:44 p.m.
(6) Bureau of Land Management Website www.blm.gov Wild Horse & Burro Fact Sheet last updated September 2007. The Tonopah Field Station has recently issued a proposed decision to zero out four more Herd Management Areas (HMAs) for wild horses. The areas span 315,962 acres targeting the Bullfrog, Goldfield, Montezuma, and Stonewall HMAs, further reducing wild horse populations nationally by 333 more wild horses. The proposed decision is found in the Montezuma Rangeland Health Assessment that continues to authorize livestock grazing in the area to achieve an eventual stocking rate of 3,164 AUMs or 600 cattle. The area is also cited as big horn and big game habitat but no management plans or population numbers were provided. 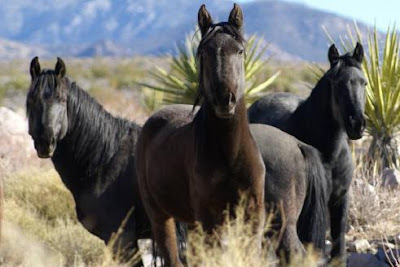 Nevada Department of Wildlife (NDOW) protested any wild horse or burro populations being managed in the HMAs at all but to BLMs credit, they rebuked NDOW by stating that they were a multiple-use agency and would not manage for exclusive use of wildlife. 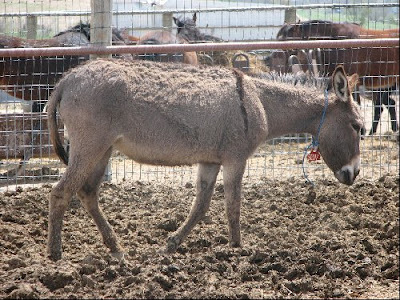 The BLM asserts that the area is too dry for wild horse use and intends to convert all forage allocations for wild burro use within the HMAs yet still reduces their allowable management levels by an additional 80 burros. The BLM removed approximately 1,400 wild horses and burros within the area between 1995-1996 due to emergency drought conditions. Almost all monitoring data provided within the current Rangeland Health Assessment used data gathered from 1994, two years before the 1,400 equids were removed. What little current data was provided indicated that vegetation and riparian areas have recovered over the last 10 years. The current proposal to zero out wild horses will also help BLM remove wild horses from an additional Herd Management Area, the Paymaster HMA, as BLM acknowledges regular movement between Paymaster and the Montezuma HMA now being zeroed out for wild horse use. This allows BLM to remove Paymaster horses that they already know migrate to the Montezuma HMA by authorizing their removals because they are “outside the Paymaster HMA boundaries”. The BLM has reduced livestock forage allocations within the grazing allotments as well as not allowing any livestock grazing within any of the HMA boundaries. 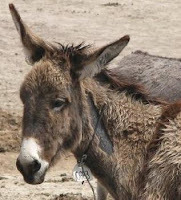 The area is very dry with limited water sources and managing for burros may be an appropriate decision, especially considering how little burro populations are now being managed nationally. However, the Tonopah Field Station is expecting to develop a new land use plan in 2009, barely a year away. During the planning process, alternatives may be developed that prevent the elimination of the 333 wild horses and zero out 4-5 HMAs for wild horse use. Please urge BLM to modify their current proposal for zeroing the HMAs out at this time and wait until the development of the 2009 Resource Management Plan so that a reasonable range of alternatives can be explored to preserve and protect the herds. Additionally, since most of the data used to make this determination was gathered in 1994, the postponement of zeroing out wild horses will allow BLM to collect data on the current populations, which are barely a fraction of what they were in 1996 because BLM misjudged the amount of wild horses and burros remaining, leaving virtually no wild populations at all. Current populations are so low that BLM expects no further removals will be required until at least 2010. Please protest the zeroing out of these HMAs until more current monitoring data is collected and alternatives can be examined in the 2009 Resource Management Plans. 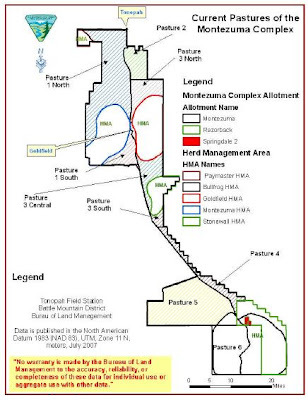 Montezuma Complex Rangeland Health Assessment, 2007. 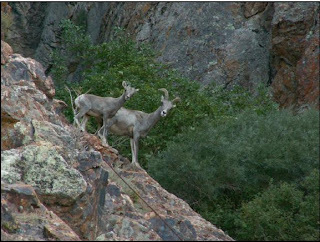 -Big horn photo in Stonewall HMA courtesy of BLM Wildlife Biologist, Bryson Code. The recent outbreak of salmonella at the Palomino Valley holding facilities has sparked questions about how BLM will be able to counteract the dangers of future contamination to wild horses and burros brought to the facility or transported to others. Research on Salmonella indicate the most common sources of transmission is through feces, contaminated food, water or the excretions of other carriers such as birds, rodents and farm animals. It has also proven to be extremely hardy and has been recovered in soil samples more than 300 days after exposure, nine months in water, up to 30 months in dried feces, and survives freezing temperatures. While attention is centered around the Palomino Valley facilities, questions about conditions at other BLM facilities still remain unanswered. Yet another example of how the general populace is required to adhere to exacting standards and laws that government entities are exempt from. 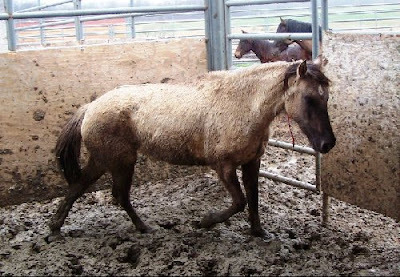 The following photos have been taken from BLMs Internet Adoption Website over the course of the last year and leads to such questions as: Where is the “animal police” or animal welfare groups that protect our wild horses and burros from the conditions portrayed here? Why is there no protection for them?